Lung obstruction is characterized by blocked airflow, shortness of breath, and difficulty exhaling. The most common obstructive lung diseases are asthma and chronic obstructive pulmonary disease (COPD), which includes emphysema and chronic bronchitis. Approximately 15% of U.S. adults aged 40–79 have lung obstruction, with about one-third of those having moderate or worse obstruction. Smoking tobacco increases respiratory symptoms, lung function loss, and the rate of lung function decline. The benefits of smoking cessation are numerous for all adults and especially for those with lung obstruction. A new NCHS report presents national estimates of cigarette smoking among adults with measured lung obstruction for the period 2007–2012. 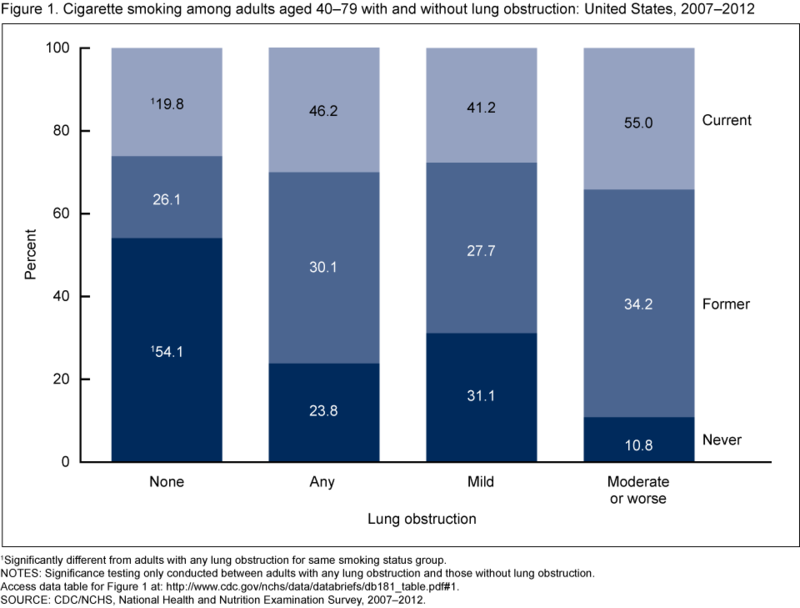 During 2007–2012, 46.2% of adults aged 40–79 with lung obstruction currently smoked cigarettes. About 41% with mild and 55% with moderate or worse obstruction were current smokers. A similar percentage of men and women with lung obstruction, overall and at each level of severity, smoked cigarettes. A greater percentage of adults aged 40–59 with lung obstruction, overall and at each level of severity, smoked cigarettes than those aged 60–79. Cigarette smoking among adults with lung obstruction varied by race and Hispanic origin and by severity of obstruction. The percentage of adults with lung obstruction, overall and at each level of severity, who smoked cigarettes declined with increasing education. This entry was posted on Wednesday, January 7th, 2015 at 6:19 pm and is filed under Uncategorized. You can follow any responses to this entry through the RSS 2.0 feed. You can leave a response, or trackback from your own site.